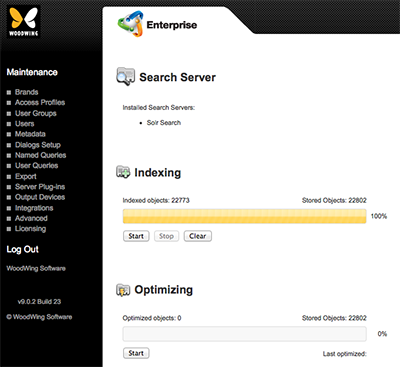 The Search Server Maintenance page in Enterprise Server 9 is used for indexing installed Search Servers (such as Solr), or for optimizing existing indexes. Step 1. In Enterprise Server, click Integrations in the Maintenance menu or on the Home page. A page with all integrated services appears. Step 2. Click Search Server.